As we look around and search for our place of belonging, the world can be a very confusing place. 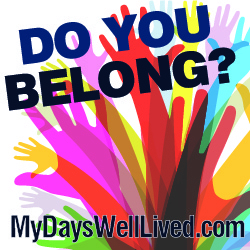 How can we find a place to belong when people are so divided? Do I have to be “all in” to fit in? Is conformity the only way? Everything seems very sorted out. Black and white. The world seems to say, “all or nothing”. There is no middle ground anymore. So we choose so that we belong, and yet, we are still lonely. One of the challenges we have as we attempt to find our true belonging is to remain open-minded and tolerant of others. We want to find people who “tick” like us, but we don’t want to form intolerant factions in the process. Veronica Roth’s novel, Divergent, is a chilling example of what life could look like if we chose our friends from a pool of like-minded people exclusively. In an earlier post in this series, What Makes You Tick, I said, ‘Our core values determine how we choose our people and our place.’ Those people and places become the concrete footings of our foundation. They support us and help prevent trouble in our life when the world gets a little crazy on us. When we find ourselves on shaky ground, these people and places remain solid, and our “house” stands firm. People who share our core values make great footings. However, if we only surround ourselves with people who think and act like us, we stop growing and thinking independently. Our world becomes like a racquetball court where our own thoughts of what’s right and wrong are just bounced back to us. We only watch TV that agrees with us. We attend church with people who agree with us. And we certainly only watch that one News channel because they agree with us. And just like that racquetball court, our world of like-minded people tends to be very small. How much better if, once we have that firm foundation and grounding of people who share our core values, we get a bit eclectic in our decorating. Just like a fun throw pillow adds some whimsy to a room, someone who goes to a different church could delight us with some new insight. Or someone who differs from us politically could add some color where we once only saw black and white. Our foundation needs to go deep. We need solid, core value-sharing people in our life. They become our people. Our footings. But let’s not forget to decorate! Our decor can be wide and diverse. Eclectic. And just like furnishings, these people may only be here for a few seasons. Unlike footings, they may come and go — but our world is so much more colorful because there were here.